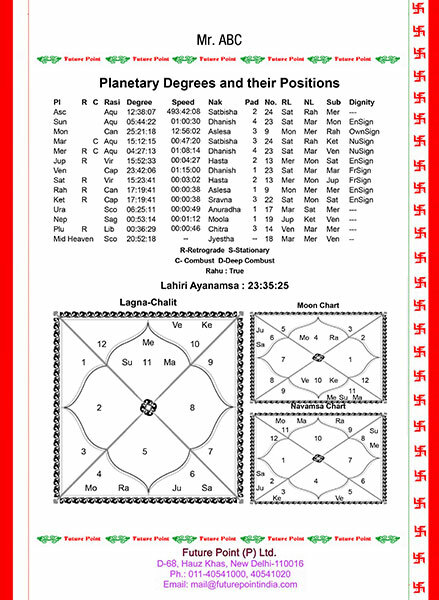 Your Kundli or Janampatri or Janam Patrika is your own birth chart that is derived by taking into account your birth details. It is of paramount importance when it comes to knowing about the significant events that are going to shape your life. The individual birth chart plays important role because it can tell a lot about the likes and dislikes of a person thereby making it easy to find a desirable match. However, after a through reading an individual online Janam kundali can predict a lot about ones married life. What is the purpose of having My Kundli? 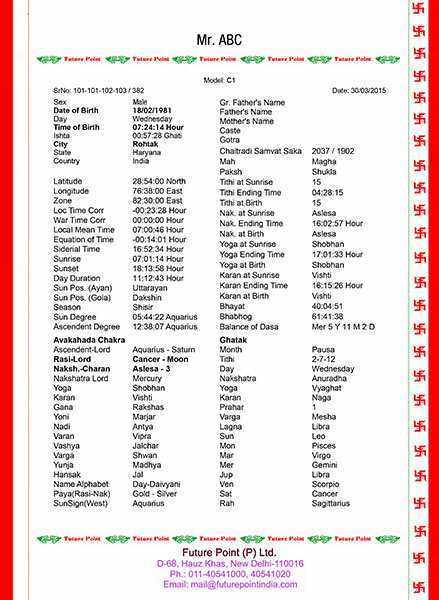 The purpose of an individual Kundli making is to get the specific planetary alignments at the time of that individual birth, that would reveal a number of aspects affecting the individual throughout his/her lifetime. Since you have your own aspirations & desires, so it is imperative that you come to know about the favourable directions or avenues that are worth channelizing your energy into, as per what the stars in your Kundli say. There is no sense in trying your luck at just about anything that comes in your mind or something that some random person suggests you do as far as making the best out of your life is concerned. For this, your Kundli plays an extraordinary role in pointing out the right path for you and thereby, removing all hurdles from your road to success. 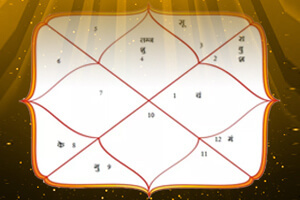 Getting an online Janam Kundali is your first step towards receiving a Kundali prediction. It reveals your true nature based on which you can get an idea of what should be the nature of your life partner in order to have a mutual understanding in your relationship. 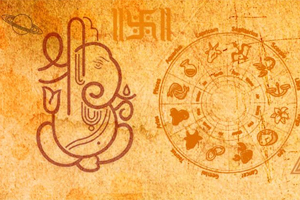 It tells you whether you have Manglik Dosha or not that could prove to be detrimental to the marriage aspect of your life, and if Manglik Dosha is present, then you can get timely astrological remedies to overcome/pacify it. 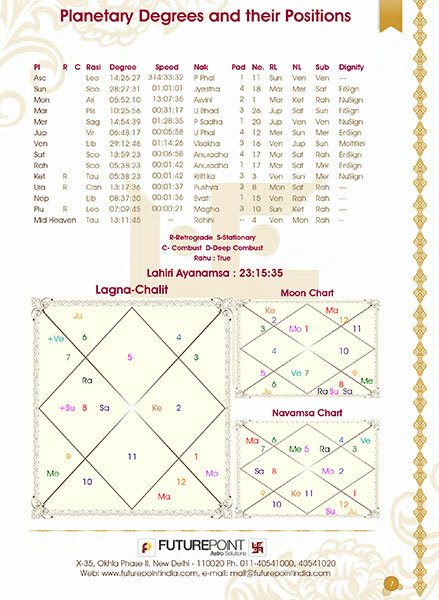 Your Janam Kundali will show not only the basic astrological details but it will focus on more intensive details like Lagna, Yoni, Gana, Varna and Nakshatra Padas that are used to look at your destiny from multiple angles. 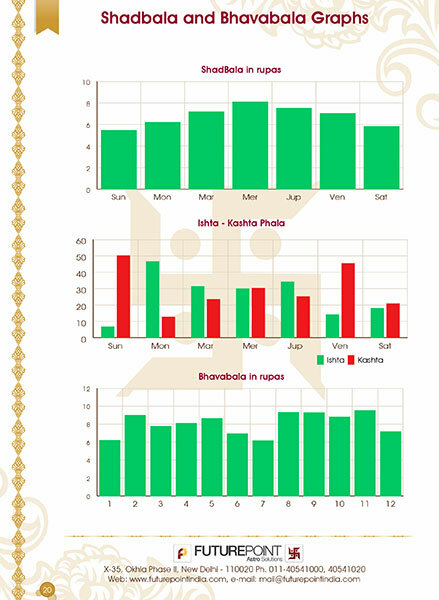 A comprehensive report will also evaluate your Horoscope/Kundli by showing your auspicious day, time, date, color and numbers which makes it more exciting to follow. It lets you identify the presence of KaalSarp Dosha and Pitra Dosha in your life which are more than capable of posing never ending hurdles in your life unless the required remedial measures are done. 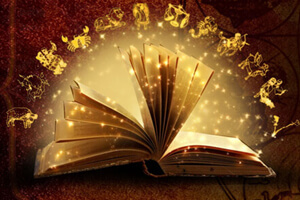 It helps an astrologer to analyze the career domains that are best suitable to you as far as the planetary positions and or their aspects on different signs of your Horoscope/Kundli are concerned, as choosing a career that brings you prosperity and satisfaction is challenging in today rapidly evolving world. 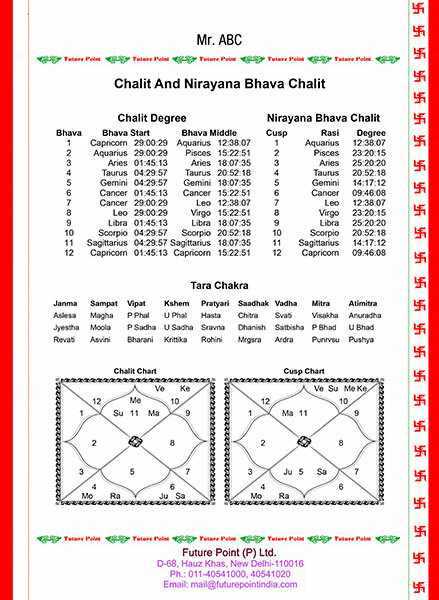 It calculates some basic yet very important charts to get an idea about the strength of your horoscope e.g., the Birth Chart, Moon Chart, Navamsa Chart, Chalit, Nirayan Bhava Chalit etc. 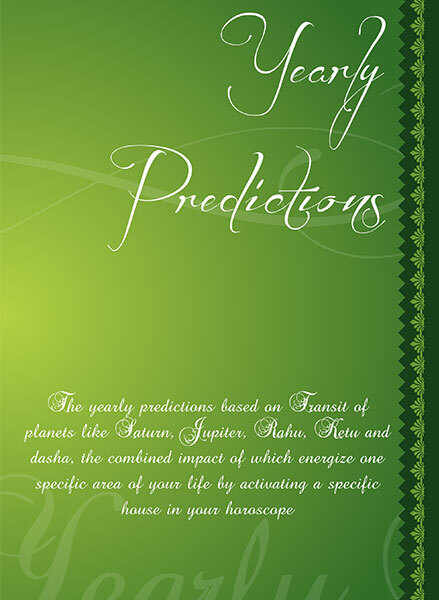 It makes Kundli prediction based on planet reading and offers Mahadasha/Antardasha Prediction for 5 years. Favourable Points - Information about lucky stone, color, number, article, time, day, date, year, sign, cereal, metal, direction, donate item, god etc.